Anti-static and breathable, low lint synthetic nylon, seamless and lightweight knt for enhanced ventilation keeoing hands cooler. 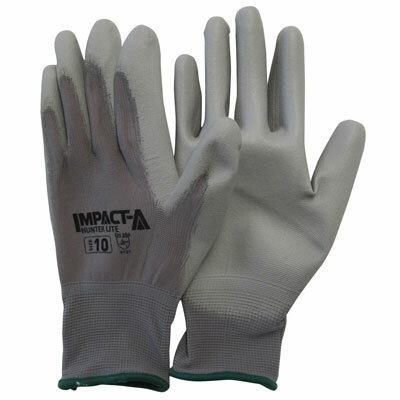 Mechanical risks approvals (EN388:4131) mean these gloves offer an abrasion and tear resistance without compromising the dexterity of the glove. Ultra-light polyurethane coated palm for improved grip and dexterity. Designed for precision tasks and handling. Ideal for precision handling in applications such as automotive assembly, production line, small parts handling and general purpose tasks. To buy IMPACT-A Gloves - Hunter Lite, please use the Store Locator below.